Over the years we have carried out extensive research into the history, design and development of instruments. Sometimes this leads us in curious and interesting directions - see our one-offs page for examples! This knowledge, combined with an acute awareness of the acoustic properties and aesthetic attraction of the tonewoods we use, enables us to produce instruments that sound as beautiful as they look. 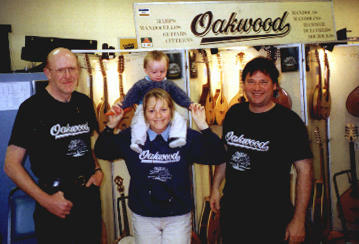 Oakwood is Martyn Banks and Gordon Hewson. Martyn trained as a designer. His final year project, on the hurdy-gurdy, led him to an instrument- making career. After working with an organ-maker, he began making harps. In 1979 he met Gordon, who had accumulated a varied range of skills from upholstery and leatherwork to furniture and motorbike restoration, before turning to lutherie. We have now been making instruments together for 30 years, but still have endless enthusiasm for new projects. In reviewing our catalogue, we were quite surprised to find that we can offer more than 70 different instruments. We make our instruments by hand in a small workshop in Oakwood, Leeds. Our approach to our craft is essentially traditional; for example we thickness our soundboards by hand and tap-tune them individually. We don't use subcontractors or sales staff - we're involved in every stage, including design, selecting the most appropriate woods and sourcing the best and most reliable fittings. And, of course, touring with the stand during the festival season.